The decorated flower design is easy to distinguish from others as it is the only one with large overlapping blossoms. Very few pieces in the pattern come up for sale. The pitcher and tumbler, in blue--the only color known, brought $1,500 and $255, respectively, at a 1998 auction. In 2013, a pitcher and a tumbler with a crack brought $1,350. A 7-piece water set sold in 2000 for $2,600; another brought $2,000 in 2004. In 2007, a blue 7-piece water set with a cannonball style pitcher, sold for $475. In 2004, a 7-piece berry set brought $550; another sold in 2005 for $225. 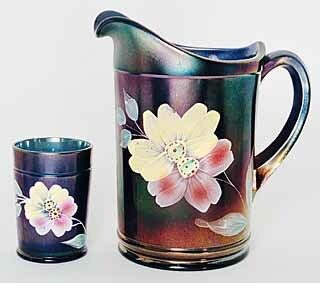 In 2014, a water pitcher sold for $450. Blue tumblers are worth $30 to $50. 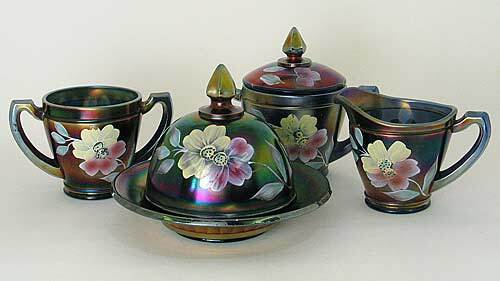 This Enameled Apple Blossom table set in blue sold for $700 at a 2005 auction. Again, at the same auction, a tumbler sold for $105. A blue spooner sold for $125 in 1997. In 2010, a blue table set sold for $375. In 2011, a blue creamer sold for $40--but in 2012, a blue creamer brought $140 while a blue spooner sold for $110. In 2016, a blue table set sold for $650 and a butter dish brought $115.